SSR-25DA, single phase solid state relay, DC control, 3-32V DC input voltage, 25A load current, 24-480V AC load voltage. High quality yet low price SSR suitable for commercial and industrial applications. 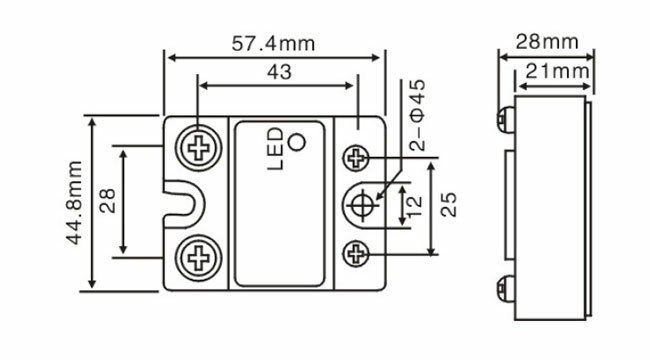 25A solid state relay (SSR), 3-32V DC input and 24-480V AC output, features compact size, high structural strength, good impact resistance, and strong shock resistance. The SSR offers a reliable switching the commercial and industrial loads, such as computer peripheral interface device, printing machine, molding machine, food machine, packaging machine, and so on. * When the load current is higher than 10A, a heat sink must be added to the SSR or the SSR should be mounted on a metal base plate with heat dissipation effect, and apply the thermal grease between them. When the load current is higher than is 40A or more, fan forced cooling or water cooling is needed. * Heat sink is Not included. Tips: How to protect solid state relay (SSR)? SSR is a semiconductor power device that is extremely sensitive to temperature changes. Overcurrent may cause damages to it. Therefore, a fast acting fuse is usually used. But it is necessary to understand its protection features, to know the relationship between fuse current and time, and to correctly choose the fast acting fuse compatible with nominal current of SSR. RC absorption circuit. The use of RC circuit not only prevents over-voltage, but also improves dv/dt. The recommended R is 20-100Ω, the power 2-5W, C 0.1-0.47uf, and the withstand voltage is 250-630V. If SSR has lower nominal current, R adopts its upper limit 100Ω and C adopts its lower limit 0.1uf. Otherwise, R adopts its lower limit and adopts its upper limit. Overheated SSRs' characteristics may compromise, ranging from the loss of control to permanent damage. It is recommended to install a temperature control switch near the SSR baseplate with temperature control point at 75 to 80 ℃. In the inductive load, SSR is usually damaged due to high rate of current di/dt. The inductance value of L depends on the size and cost level. 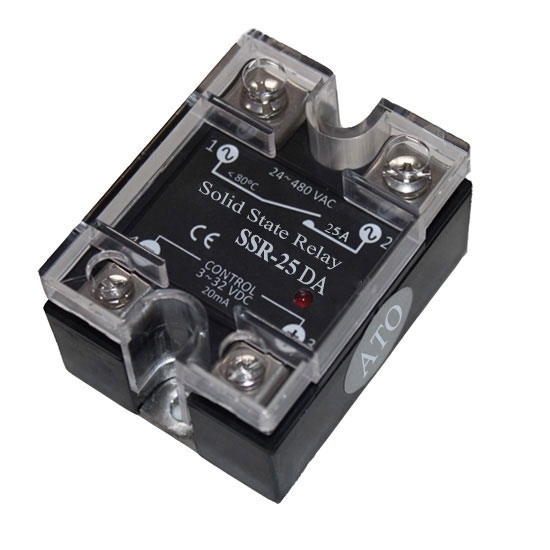 Solid state relay (SSR) is simple but widely used in the automation fields. Thus, it is not complex to wire a solid state relay. In this vedio, ATO takes a 40 Amp SSR (DC - AC) for example to show the wiring of a SSR and then switch on/off a motor with this SSR. This is a great solid state relay. This is a great solid state relay. I used it for electric heater and works as expected. It would be much better if it could come with a heatsink. Good unit.